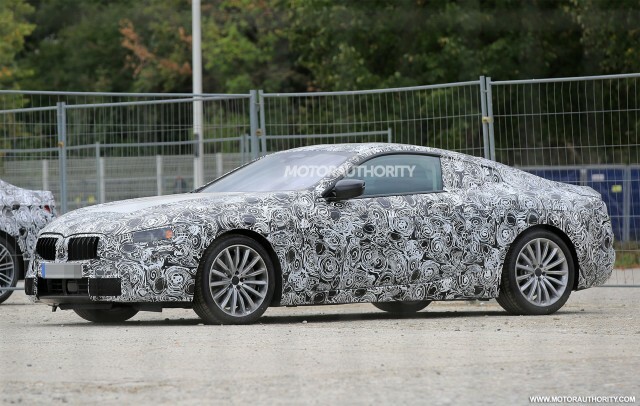 BMW is working on a flagship coupe to revive the 8-Series name and today we have our first spy shots of a prototype. BMW hinted at the model in March when senior executives said the automaker was looking at adding more high-end models. One of these will be the 8-Series. Another will be an i8 Spyder. Some readers will recall BMW had started work on a large, coupe-like sedan based on the striking CS concept car of 2007. However, the global financial crisis that erupted that year put an end to the project. Recent BMW trademark filings suggest V-8, V-12, M Performance and dedicated M options for the car. The filings included “850”, “860”, “M850” and “M8.” It’s possible the M8 will feature a high-performance hybrid system known as the Power eDrive plug-in hybrid. The system combined a turbocharged inline-4 with a pair of electric motors for a combined 670 horsepower. The V-12 models should feature the same 600-hp twin-turbocharged 6.0-liter engine from the latest M760i xDrive. Production of the 8-Series will take place at BMW’s main plant in Dingolfing, Germany, most likely starting in 2019. This means we should see the car introduced as a 2020 model. Rivals will be the Lexus LC, Maserati Gran Turismo and Mercedes-Benz S-Class Coupe. To make way for the 8-Series in BMW’s lineup, the slow-selling 6-Series will be phased out. Don’t be too sad because we hear a new 6-Series will eventually arrive, although it will be a much sportier proposition to take on the Jaguar F-Type, Mercedes-AMG GT and of course the Porsche 911. Eventually, BMW is likely to add an 8-Series Convertible and perhaps even a four-door 8-Series Gran Coupe to its lineup.